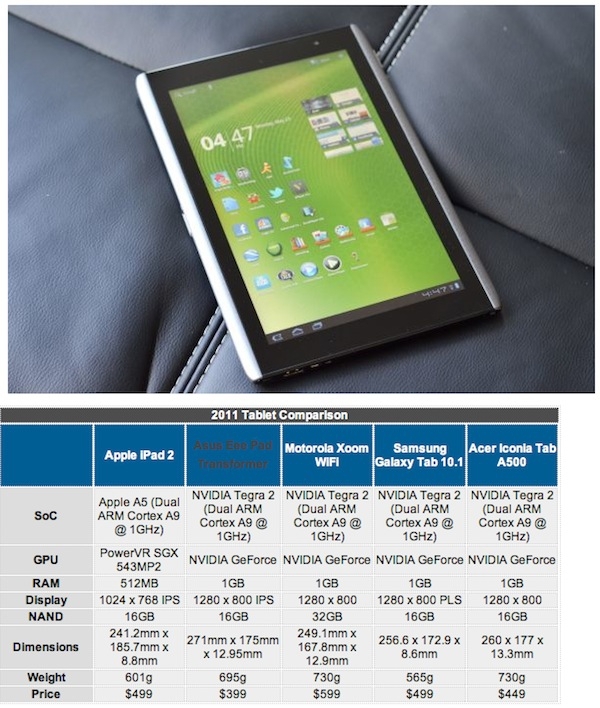 "Next in our series of Honeycomb tablet reviews is the Acer Iconia Tab A500. The A500 was the second Honeycomb tablet to go on sale, and is one of four on the market at present, all of which are very similar. They share basic specs—10.1” 1280x800 displays, NVIDIA’s Tegra 2 underhood, 1GB LPDDR2 RAM, 16-64GB onboard NAND, front and rear facing cameras with HD video capture, basic wireless connectivity options, and stock versions of Android 3.0/3.1 Honeycomb (albeit with different preloaded software packages)." A telling comment is that the reviewer liked the A500 better when he read about it than when he actually had one in his hands to review. Cheaply designed and cheaply manufactured, the A500 is good for a bargain price of $379 (where it has sometimes sold at MacMall's eBay store), but the alternatives are better. His recommendation is to wait for the next generation of hardware to appear, or, if you can't wait, to look for an ASUS Eee Pad Transformer, if you can find one.